All come mounted for use! We have been selling high quality antique and vintage ship's bronze bells for over fourteen years. With a shrinking supply, our challenge has changed to finding the types of bells that are most appreciated by our customers which turns out to be authentic U.S. Navy bells from WW II and earlier. Sometimes we sell them without polishing if the natural patina over the years is dramatic to view. We have some polished at considerable expense, if we feel they should be preserved as they would have been on shipboard and as a work of industrial art. All come with a proper bell rope and means of display. 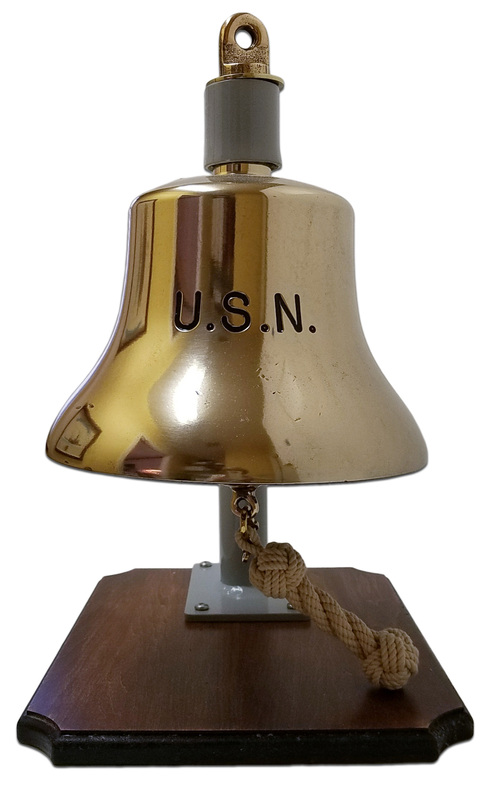 We have established a reputation as a specialist in providing U.S. Navy bells that are suitable for ceremonial occasions and as gifts for retiring officers. CONSIGNMENT: If you have a bell you wish to consign, contact us for a quick appraisal and our personalized consignment arrangement which is the best deal possible. See our points of contact below. 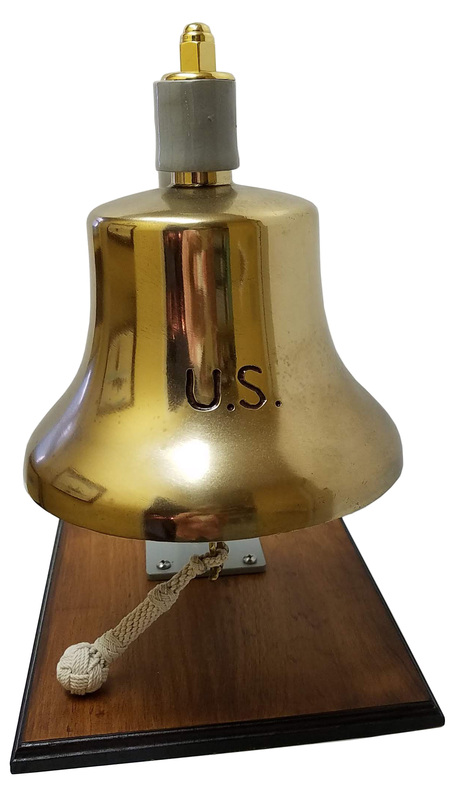 We sell only authentic, seagoing bells that met the international and U.S. Navy regulations for use at sea that was in force when they were made. There are no reproductions here. 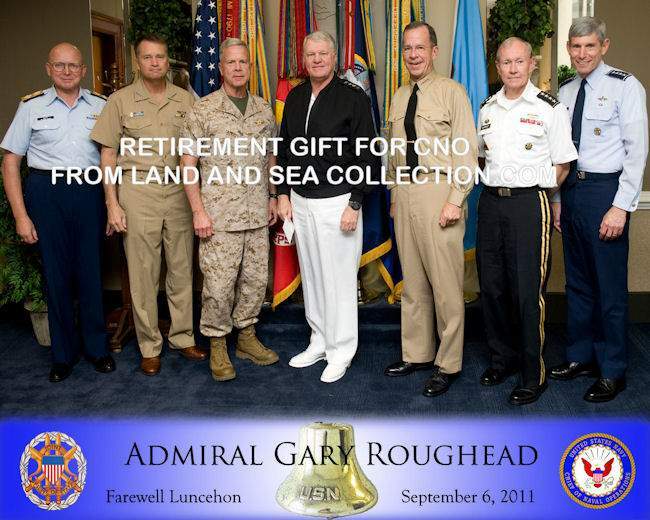 In 2011, we were honored to be selected by the Chairman of the Joint Chiefs of Staff, ADM Mike Mullen, USN to provide a retirement gift for ADM Gary Roughhead former Chief of Naval Operations. Since then in 1912, we furnished a Navy bell as a gift to a former Secretary of the Navy and additionally two ships wheels for his new library in 1913. And again in 2013, a very rare Navy WW II Bell was furnished to the Department of the Navy for special use. Please scroll down. There are numerous rare ships bells this page. Their pictures are linked to detailed information and more detailed photographs. Other bells might be in stock, so please inquire by email if you don't see what you want. BELFRY 18 1/2" W x 9 1/2" D x 1"T Height 13"
4" dia crown, 5" dia mouth Height 4"
Display 7 Lbs. 5 oz. 12 1/2" Wide Weight 19 Lbs. Dia crown 5 1/2 " Dia mouth , 9 1/2" Height 16 1/2"
Former Secretary of the Navy! SOLD as gift to retiring Naval Aviator! 5" crown, 9" mouth, 11" height, 18 Lbs. SOLD as 30 Year Retirement Gift! Stand 16" x 12" x 3/4" Weight 24 Lbs. SOLD. Thank you.! CPO Retirement Gift. 12 1/2" Wide Weight 18 Lbs. 9 3/4" height, 27 Lbs. 5 1/2 " Dia crown, 10" Dia mouth Height 7 1/2"
Weight 5 lbs Marked "Loeffler"
Stand 18" x 13 1/2" x 3/4" Weight 34 1/2 Lbs. 9" Height, 9" dia. mouth Weight 32 Lbs. to Active Duty Sailor. Thank you! 9 3/4" height, 18 Lbs. 10 1/4" height, 26 Lbs. SOLD to US Military in Thailand. Dated 1958, SOLD, Thank You! SOLD to NROTC Unit. Thank you!